00:45 WITH MY FRIEND SANDRA LEVITT. 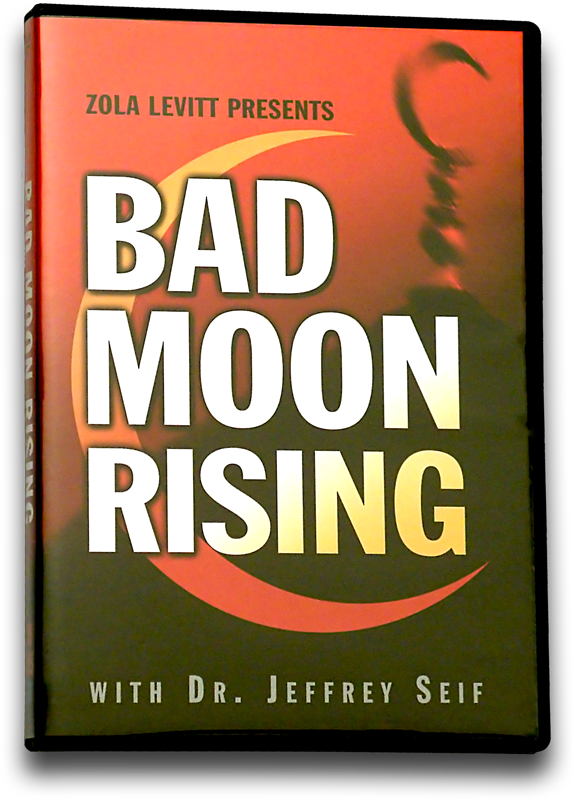 00:47 AND WELCOME BACK TO "BAD MOON RISING"
00:53 THAT EVIL PRESENTS ITSELF IN THE WORLD. 00:55 WE'VE LOOKED AT THE HOLOCAUST. 00:56 WE'RE STILL GOING TO LOOK AT THE HOLOCAUST. 01:00 THEY ALMOST GOT THE ATOM READY. 01:03 DEEP UNDERGROUND STEALTHILY THEY WERE WORKING ON THE ATOM BOMB. 01:08 I CANNOT IMAGINE WHAT WOULD HAVE HAPPENED IF THEY REALLY HAD DEVELOPED THAT ATOM BOMB? 01:15 OR IT WOULD HAVE ALL COME UNGLUED. 01:20 "WHAT WOULD THE WORLD HAVE LOOKED LIKE IF GERMANY HAD WON?" 01:23 WELL, THERE WOULDN'T BE JEWS TO LOOK AT. 01:25 ZOLA LEVITT PRESENTS WOULDN'T BE PRESENTING. 01:27 THAT'S RIGHT BUT I AM GRATEFUL THAT WE'RE HERE. 01:30 IT WOULD HAVE KILLED US ALL OFF. 01:32 SO WHAT ARE WE DOING HERE? 01:34 WHAT IS THE PURPOSE OF THIS WHOLE PROGRAM, THIS WHOLE SERIES? 01:36 WHAT IS THE PURPOSE? 01:37 WE WANT TO LOOK AT THE BIBLE. 01:39 WE WANT TO LOOK AT HISTORY. 01:47 THAT WICKEDNESS IS RAISING ITS HOARY HEAD IN ANOTHER FORM. 01:51 WE'LL BRING THE TWO TOGETHER FOR YOU IN A MOMENT. 02:02 (Jeff speaking) HAIGERLOCH IS ARGUABLY ONE OF THE MOST BEAUTIFUL TOWNS I'VE EVER BEEN TO. 02:11 IT IS JUST A TOWN THAT'S BEAUTIFUL, ITS PRIVATE, ITS SECLUDED. 02:23 AND IT WAS PAST AROUND A FEW TIMES. 02:32 A CHURCH DEDICATED TO SAINT ANNE. 02:34 A BEAUTIFUL PLACE, A BEAUTIFUL CASTLE, A BEAUTIFUL CHURCH. 02:46 DEDICATING THEN THE COMMUNION ALTAR TO A PARTICULAR MEMORY OF A PARTICULAR PERSON THAT DEDICATED THE CHURCH. 03:04 DUG DEEP AND DIRECTLY UNDERNEATH IT. 03:14 AND THROW THE THIRD REICH THEN INTO THE ATOMIC AGE. 03:20 AND THEY CAME EVER SO CLOSE. 03:26 THE RACE WAS ON AS WORLD WAR II WAS PRESSING TO A CONCLUSION HERE ON THE EUROPEAN THEATRE. 03:45 WITH THE SPLITTING OF THE ATOM, THE ENRICHMENT OF URANIUM. 03:49 I DON'T WANT TO TALK TOO MUCH ABOUT IT. 03:51 I'M NOT AN EXPERT IN THAT FIELD. 03:53 BUT THERE ARE EXPERTS THAT HAVE COME AND STUDIED HERE AND WRITTEN ON THE SUBJECT. 04:03 FOR ME IS STRIKING FOR A VARIETY OF REASONS. 04:13 THE NAZIS CAME THIS CLOSE TO AN ATOM BOMB. 04:20 BY WHICH THEY COULD THEN LAUNCH THEIR UNCONVENTIONAL WEAPONS WITHOUT NEEDING TO SEND AIRCRAFT. 04:27 THAT WOULD HAVE BEEN DECISIVE IN THE WAR. 04:29 AND THEY CAME THIS CLOSE; THEY ALREADY HAD JETS IN THE AIR. 04:36 AND AS A JEW I DO MEAN THAT SINCERELY. 04:38 NEVER MIND ME BEING AN AMERICAN ON TOP. 04:44 AND THANK GOD WE GOT IT BY THE GRACE OF GOD JUST BEFORE IT WAS TOO LATE. 04:59 AND I'VE BEEN TO MORE THAN ONE VILLAGE. 05:21 THE MODEL OF WHICH IS HERE. 05:23 ALL WITH AN AIM TO WIN THE RACE TO GET AN ATOM BOMB OUT. 05:38 A MILITANT CULTURE DRIVEN BY A DEMON INSPIRED PHILOSOPHY. 05:52 THIS, BY THE WAY, REMINDS ME AT A CERTAIN LEVEL OF WHERE WE ARE AT THIS VERY DAY. 06:01 BUT I DO WANT TO INFORM THAT WE DO WELL TO BE ALARMED. 06:06 AND I'M NOT SPEAKING ON MY OWN AUTHORITY IN MAKING THAT POINT. 06:29 WHERE HE SAID, "LISTEN, MAHMOUD AHMADINEJAD IN IRAN"
06:34 "IS THREATENING TO DO IN 12 MINUTES WHAT HITLER COULDN'T DO IN 12 YEARS." 06:56 AND FAVORS HE CALLED UPON AS HE WAS DEVELOPING HIS WAR MACHINERY HERE IN NAZI EUROPE. 07:17 IS THE ATTEMPT 60 YEARS AGO BY HITLER AND NAZISM TO ACQUIRE ATOMIC WEAPONS. 07:23 AND YOU KNOW THAT HISTORY WOULD HAVE TAKEN A FAR DIFFERENT COURSE IF THAT HAPPENED. 07:26 SO THIS IS SOMETHING THAT MUST BE STOPPED. 07:31 THE FACT THAT IT DENIES THE HOLOCAUST, CAN YOU IMAGINE? 07:42 BECAUSE THEY'D LIKE TO PAVE THE GROUND FOR A NEW ONE. 07:45 AND I THINK THIS IS A VERY GREAT DANGER FOR ALL OF US. 07:50 IT IS TERROR MULTIPLIED TO THE NTH DEGREE. 07:53 IT IS SOMETHING THAT HAS TO BE STOPPED. 08:45 ASK FOR OUR FREE MONTHLY NEWSLETTER, THE LEVITT LETTER. 08:51 WITH THE LATEST VIDEOS, BOOKS AND MUSIC. 08:58 READING PACKETS, TEACHING CDS AND MAIL IN TESTS. 09:05 OR CRUISE THE MEDITERRANEAN VISITING GREECE AND EPHESUS. 09:09 PLEASE CONTACT US FOR MORE INFORMATION. 09:16 AND ITS NOT THAT I WANT TO BE AN ALARMIST. 09:21 AT ISSUE ISN'T SO MUCH THE FACT THAT THERE'S A NATION STATE THAT HAS NUCLEAR CAPABILITIES. 09:27 GOD KNOWS THERE ARE NATIONS THAT HAVE ALREADY COME CLEAN WITH THEIR NUCLEAR PROGRAMS. 09:42 THAT'S HELL BENT WITH THEIR OWN VOCABULARY IN DECIMATING ISRAEL. 10:00 SINCE THE FOUNDING OF THE FLEDGLING STATE IN THE LATE 40'S. 10:05 ALL TO NO AVAIL. 10:13 ANNIHILATE A NATION STATE. 10:16 NOW THERE IS REASON FOR CONCERN. 10:33 BUT A CORE VALUE BEING TO QUOTE, "DRIVE ISRAEL INTO THE SEA." 10:44 THAT RESONATES DEEPLY IS CAUSE FOR CONCERN AS WELL. 10:56 NEVER MIND A NUCLEAR OR ATOMIC REACTOR. 11:14 TO MAKE ITS ENTRANCE ONTO THE STAGE OF THE HUMAN DRAMA. 11:27 A HARBINGER OF IMAM WHOSE GOING TO ARISE FROM HISTORY AND BE IN EFFECT THE ISLAMIC MESSIAH. 11:40 OF A WORLD GONE BAD, A WORLD AT WAR. 11:43 AND A NUCLEAR PROGRAM SEEMS TO FACTOR INTO THAT. 11:59 MY QUESTION IS, "IS IT UNREASONABLE TO BE CONCERNED?". 12:05 IS IT UNREASONABLE TO THINK WE NEED TO PUT A STOP TO THAT? 12:19 AND THANK GOD THAT WE NIPPED IT IN THE BUD. 12:29 "THANK GOD THAT WE DEVELOPED A MECHANISM TO DECISIVELY DEAL WITH THE IRANIAN THREAT." 12:43 WHEN THE BUTTONS GET PUSHED AND ALL OF A SUDDEN WE'RE LOOKING A NUCLEAR RAIN? 13:00 I DON'T LAY SIEGE TO THE CLAIM THAT I UNDERSTAND EXACTLY, PRECISELY HOW EVERYTHING PLAYS OUT. 13:10 THAT LENDS CREDENCE TO AN UNDERSTANDING OF A WORLD ABLAZE IN FIRE. 13:28 IS ATTESTATIONS TO A WORLD GONE BAD, A WORLD SET ABLAZE WITH UNCONVENTIONAL WEAPONS. 13:56 AS BEING GOD'S JUDGMENT AS IN NUCLEAR BASED ON THAT VERSE. 14:00 IT'S WHAT FOLLOWS IT THAT TO ME IS RATHER STRIKING. 14:28 LET'S EXPLORE THAT IN A MINUTE WHEN I COME BACK I WANT TO DO JUST THAT. 14:44 THAT'S JEFF IN THE ATOM KELLER. 14:48 TALKING ABOUT EZEKIEL CONTINUING THE TEACHING IN EZEKIEL. 14:52 IT IS AMAZING TO ME HOW CLOSE THE GERMANS CAME TO GETTING AN ATOM BOMB. 14:57 IT JUST SIMPLY AMAZES ME. 15:05 THE BEAUTY AND THEN THE EVIL UNDERNEATH, AMAZING TO ME. 15:07 THE CONTRAST IS STRIKING. 15:16 TO TEACH THE BIBLE, TO GET THE WORD OUT THERE IN WORLD AND PUT IT ALL TOGETHER. 15:19 I DON'T THAT WE WOULD HAVE SEEN THAT ANY OTHER PLACE. 15:22 I DON'T KNOW THAT I'VE EVER SEEN ANY KIND OF FOOTAGE ON THAT. 15:29 THE MACHINATIONS OF THE WORKINGS OF AN ATOM BOMB. 15:41 THEN THE WORLD WOULD HAVE BEEN MARKEDLY DIFFERENT. 15:47 I THINK THAT'S JUST AMAZING. 15:51 AND NOW PEOPLE ARE A LITTLE AMBIVALENT. 15:53 BUT THEY SHOULDN'T BE. 15:54 WE ARE, WE'RE TRYING TO BE REDEEMERS. 15:56 WE'RE TRYING TO MAKE THE WORLD THE RIGHT PLACE. 15:59 THERE'S A SILENT ARMY ALL OVER EUROPE AND ALL OVER THE WORLD. 16:05 "ENOUGH IS ENOUGH AND WE'RE GOING TO STAND UP AND WE'RE GOING TO SPEAK UP." 16:08 AND ONE OF THOSE PEOPLE IS TED PEARCE. 16:10 HE IS A NICE YOUNG MAN, UPCOMING WRITER, SONGWRITER. 16:14 HE WENT TO THIS MARCH. 16:16 IT CHANGED HIS LIFE. 16:24 HEALING THROUGH PILLS OR WHATEVER. 16:27 WE REALLY THINK WE CAN BUY ANYTHING. 16:35 IS WE THINK WE CAN BUY THEM. 16:37 AND WE DON'T UNDERSTAND THAT MONEY ISN'T EVERYTHING TO EVERYBODY LIKE IT IS TO AMERICANS. 16:42 IF I HAD TO GO FOR THE ROOT OF THE PROBLEM THAT'S WHAT I'D SAY IT IS. 16:45 WE DON'T UNDERSTAND THE KIND OF HATRED THAT'S BEING DIRECTED AT US. 16:56 OR AT LEAST BUY RESPECT. 17:06 THEY HAVE NOTHING TO COMPARE IT TO. 17:14 "HOW ARE WE GOING TO KILL THE JEWS AND THE AMERICANS AND THE CHRISTIANS." 17:20 AND ANNA NICOLE'S BABY. 17:22 SO WE DON'T UNDERSTAND. 17:23 WE JUST DON'T UNDERSTAND. 17:32 AND HE THREW HIS ENERGY BEHIND IT. 17:37 SINGING ABOUT THE JEWS, PUTTING IT ALL TOGETHER. 17:39 GREAT GUY ISN'T HE? 17:41 (Sandra speaking) HE IS, IN FACT HIS SISTER-IN-LAW WORKS FOR OUR MINISTRY. 17:44 SO AND IT'S JUST BEEN A REAL BLESSING TO GET TO KNOW BOTH OF THEM. 17:47 I KNEW HIM BEFORE HE WAS ENGAGED IN FULL TIME MUSIC MINISTRY. 17:50 NOW HE'S A RISING STAR IN THE WHOLE MUSIC WORLD. >>HE REALLY IS. 17:54 AND EVERYBODY LOVES WHAT HE DOES. 17:55 BUT I LIKED HIS INTERVIEW. 18:02 BEING CONCERNED THAT WE THINK WE CAN BUY ANYTHING IN THE WHOLE WORLD. 18:18 FOR US TO STAND UP AND SAY THAT'S ENOUGH? 18:22 AND IT'S GOOD TO HAVE STORIES OF THOSE WHO DO. 18:26 YEAH, AND THEN WE'RE GOING TO LOOK AT ERGUN CANER WHO ZOLA INTERVIEWED. 18:37 "WE'RE BRINGING A MUSLIM OVER TO INTERVIEW WITH YOU." 18:47 AND I REALLY, REALLY WANT YOU TO WATCH THIS. 18:58 "DOES THE KORAN REALLY TEACH THAT THEY SHOULD KILL US?" 19:03 THIS SORT OF QUESTION. 19:18 "JIHAD IS A STRUGGLE." 19:19 "IT MEANS WE ARE PEACE LOVING." 19:21 "ISLAM MEANS PEACE AND SUBMISSION." 19:27 ARE HORRIFIED BY WHAT TOOK PLACE. 19:29 BUT THAT'S BECAUSE HERE IN AMERICA JIHAD IS A THEORY. 19:34 THERE'S NEVER BEEN A DECLARED JIHAD BY THE CALIPHATE, BY THE LEADERS HERE IN AMERICA. 19:43 IT'S NOT THEORY, ITS LIFE, IT'S WHAT WE LIVE WITH. 19:46 WHAT GETS TO ME IS THAT YOU CAN SAY THAT'S WHAT WE TEACH BUT WE DON'T FOLLOW THAT. 19:53 YOU CANNOT GO BACK AND CHANGE WHAT THE KORAN SAYS. 19:59 AS WAS MY BROTHER, AND BOTH OF MY BROTHERS. 20:02 WE WERE IN YOUTH GROUPS THAT WE'RE TAUGHT THESE VERSES OF THE HADITH. 20:07 THE HADITH YOU KEEP MENTIONING IS MUHAMMAD'S SAYINGS? 20:15 AND THEN "MUHAMMAD SAID," AND THIS IS THEIR QUOTE. 20:18 I'LL GIVE YOU AN EXAMPLE DR. LEVITT. 20:31 "NO ONE CAN BE KILLED FOR KILLING AN INFIDEL." 20:36 "IF A MAN CHANGES HIS ISLAMIC RELIGION KILL HIM." 20:41 YEAH, IT'S NOT AMBIGUOUS BUT IT'S VERY STRANGE. 20:45 IF YOU CONVERT, SOMEWHERE, THEY'LL KILL YOU. 20:47 AND IT'S VERY STRAIGHT FORWARD. 20:49 THERE IS IN THE KORAN A REDACTION. 20:52 THEY WOULD SAY ABRAHAM WAS NOT A JEW OR A CHRISTIAN BUT WAS A GOOD MUSLIM. 20:55 I MEAN THAT IS A QUOTE IN THE KORAN. 21:02 "WE DON'T BELIEVE IN JIHAD." 21:04 "JIHAD IS NOT THAT"
21:07 TO ME THAT'S DISINGENUOUS. 21:15 THIS KIND OF VERY CHEAP....? 21:18 THE ACT OF JIHAD ARE IN THEOLOGICAL TERMS THEY'RE HIERARCHIALISTS. 21:23 THEY BELIEVE THAT THE END JUSTIFIES THE MEANS. 21:30 THERE ARE NO CIVILIANS ANYMORE, WE ARE ALL SOLDIERS. 21:33 AND IN JIHAD THAT'S THE TEACHING. 21:34 IT JUST DOESN'T MAKE SENSE ERGUN. 21:42 THEY ARE PART OF THE STRUGGLE. 21:44 EITHER THEY ARE AGAINST US OR THEY ARE WITH US. 21:50 THEY BELIEVED THEY DIED AS MARTYRS AS WELL. 21:57 THEY BELIEVE THEY ARE IMMEDIATELY TRANSLATED INTO PARADISE. 22:18 AND YOU ARE TRANSLATED TO THE HIGHEST LEVEL OF PARADISE. 22:21 AND SO THE PROMISE WAS MADE. 22:25 THAT'S THE TERRORIST THAT FLEW THE AIRPLANE INTO THE WORLD TRADE CENTER. 22:28 YES SIR, YES SIR. 22:35 WHICH THEY CALL PARADISE. 22:37 JIHAD IS A VERY ARTICULAR ACT. 22:40 THERE ARE VERY SPECIFIC RULES. 22:42 YEAH, TELL ME THE 3 LEVELS OF THE JIHAD. 22:44 THIS IS THE ARAB WAR SO TO SPEAK. 22:55 THE STEPS THEY HAD TO FOLLOW BEFORE THEY ACTUALLY GOT ON THE PLANE. 23:04 AND THEY'RE ACTS THAT YOU MUST GO THROUGH. 23:06 JIHAD IS VERY SPECIFIC. 23:13 THAT ARE EXTRAPOLATED IN THE HADITH AND IN THE KORAN. 23:25 THEY SURE ACCOMPLISHED THAT AT THE WORLD TRADE CENTER. 23:28 ABSOLUTELY, HOW MUCH MORE CAN THEY SHOCK US? 23:41 YOU ARE STILL SUSCEPTIBLE TO ATTACK. 23:44 AND SO A 2ND ACT OF JIHAD MAY NOT BE HERE IN AMERICA. 23:53 AND SECURE AND YET THE ACT CUTS TO THE HEART OF IT. 23:57 THE 3RD ACT OF JIHAD IS AN ACT OF HUMILIATION. 24:03 AND IN SO DOING IT CUTS US OFF AT OUR KNEES. 24:07 IT MAKES US THE WEAKER VESSEL AND THUS WE'RE OVERTAKEN. 24:11 THAT'S THE WAY JIHAD IS TRADITIONALLY TAUGHT. 24:23 "THIS WAS AN ACT OF WAR." 24:25 IF WE HAD NOT THEN WE WOULD HAVE BEEN PERCEIVED AS WEAK. 24:27 AND IN THAT PERCEPTION THEY WOULD HAVE DONE MUCH WORSE. 24:31 BECAUSE A WEAK ENEMY IS TO BE OVERTAKEN. 24:34 A STRONG ENEMY IS TO BE ENGAGED. 24:39 THE JIHAD, TO THEM ANYTHING IS JUSTIFIED IN THE ACT OF FIGHTING ALLAH'S GLORIOUS CAUSE. 24:48 HE IS PRAISING THOSE MEN, CALLS THEM MARTYRS, WHO DID THIS HEINOUS ACT. 25:05 THAT'S THE ULTIMATE END. 25:08 THE CORPORATE AIM IS THAT WHICH IS SUPREME. 25:19 AND GOD CAN CHANGE PEOPLE AND BRING US TOGETHER AS A PEOPLE OF ONE. 25:24 WELL, AN UNBELIEVER BECOMES A BELIEVER, THEIR HEARTS CHANGE. 25:27 PAUL SAYS WE ARE A NEW CREATION. 25:29 AND WE ARE A NEW CREATION. 25:33 WAS THAT HE WALKS IN THE DOOR AND HE IS A NEW CREATION. 25:38 HIS DEMEANOR IS WONDERFUL. 25:45 TO BE RE-CREATED, TO BECOME A NEW CREATURE IN GOD'S MESSIAH, JESUS. 25:49 ABSOLUTELY, WE'RE TALKING ABOUT PEACE. 25:58 BUT THEY ALSO SAY "SALAM" WHICH MEANS PEACE. 26:05 PEOPLE THINK THAT ISLAM'S THE RELIGION OF PEACE. 26:12 THEN THERE'LL BE PEACE ON EARTH CAUSE THEY HAVE THE PUZZLE. 26:15 BUT THAT IS THEIR AGENDA. 26:16 THEY MAKE NO APOLOGIES FOR IT. 26:20 "WE WANT THE WHOLE WORLD TO BE ISLAMIC,"
26:23 "EITHER BY THE SWORD OR ANY OTHER WAY WE CAN TAKE IT." 26:26 THEIR GOING TO DO IT. 26:31 THAT PIERCES HEARTS AND INVITES PEOPLE TO BE TRANSFORMED IN JESUS NAME. 26:35 AND ISN'T THAT WHAT WE WANT FOR ANYONE THAT'S LISTENING TO US? 26:39 "SHA' ALU SHALOM YERUSHALAYIM"
26:40 PRAY FOR THE PEACE OF JERUSALEM.